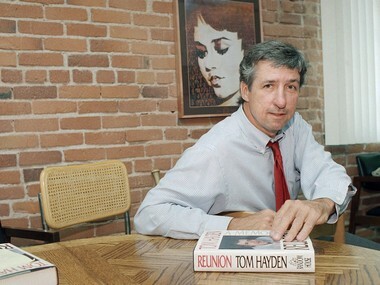 Santa Monica, California: Tom Hayden, a '60s anti-war activist whose name became forever linked with the celebrated Chicago 7 trial, Vietnam War protests and his ex-wife Jane Fonda, has died. He was 76. Thomas Emmet Hayden was born 11 December, 1939, in Royal Oak, Michigan, to middle-class parents. At Michigan, he took up political causes including the civil rights movement. He wrote fiery editorials for the campus newspaper and contemplated a career in journalism. But upon graduation, he turned down a newspaper job. As he wrote in his memoir, "I didn't want to report on the world; I wanted to change it." In the interim, a single event galvanized him — the 1968 assassination of his friend, Sen. Robert F. Kennedy, in Los Angeles. "I went from Robert Kennedy's coffin into a very bleak and bitter political view," Hayden told the Associated Press in 1988.